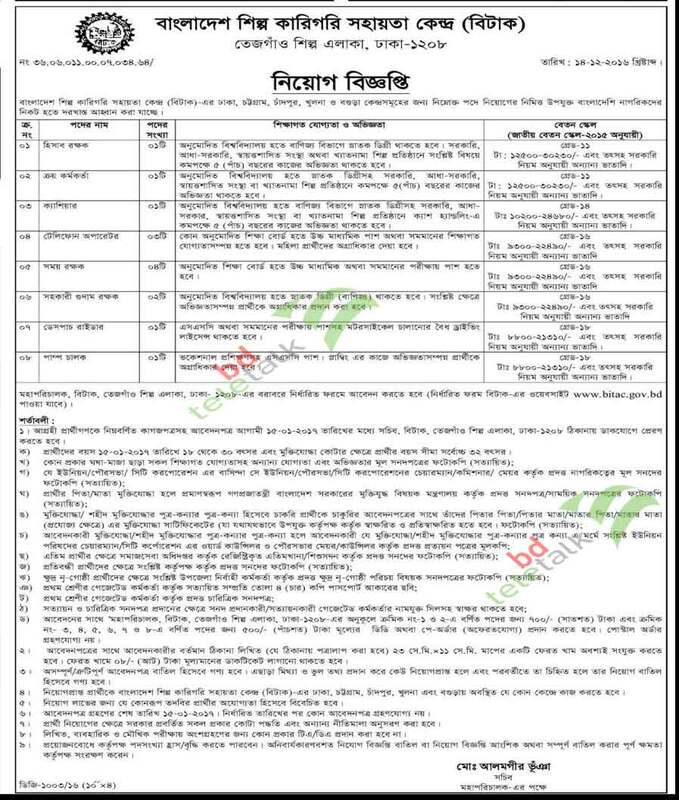 Bangladesh Industrial and Technical Assistance Center BITAC published a job circular for the various post under Dhaka, Chandpur, Khulna and Bogra center. The BITAC job circular has been published on 17 December 2016 at Prothom Alo newspaper. Interested candidates of origin Bangladeshi citizen can apply by download the application from www bitac gov bd. Application started from the advertisement and should be reached to BITAC office by 15th January 2017. Here we will update here BITAC job written exam seat plan and written exam result as well. Bellow you have to see the BITAC job circular 2016 details. Like position, Education qualification, Experience, Salary and vacancy list. Before apply you should read carefully the full advertisement. Educational Qualification : Bachelor Degree in commerce background. Should be 5 years experienced in related field. Educational Qualification : Bachelor Degree. Should be 5 years experienced in related field. Educational Qualification : HSC or equivalent. Female candidates are preferable. Educational Qualification : SSC passed with vocational training. Interested and eligible candidates should apply by 15 January 2017 to the following address which in mention on advertisement. Candidates should download the application form from www bitac gov bd official website. Candidates age limit should be 18 to 30 years. All the post Bangladesh Industrial and Technical Assistance Center will follow the Bangladesh government rule and quota. Candidates will face written exam, practical and viva voice. Here you will see Bangladesh Industrial and Technical Assistance Center BITAC job written exam result, BITAC written exam seat plan and viva result. Also the final selection candidates list so far via www bitac gov bd. www bitac gov bd. www birtan teletalk gov bd. www bitac gov bd com. www bitac gov bd application form. bitac gov bd. bitac. bitac job circular. bitak bogra job.